One of the most difficult challenges for snow and ice management professionals is educating customers and prospective customers about the realities of the snow business. Far too many buyers of snow and ice management services make purchase decisions without understanding how to optimize their relationships with service providers. Because of this knowledge gap, they make poor and untimely contract award decisions, resulting in the selection of less qualified providers, more costly services and, ultimately, less value. At the same time, far too many service providers are ill-equipped to advise and educate buyers about the optimal way to purchase snow and ice management services, even though they’re keenly aware that there’s a better way. As a result, neither the buyer nor the seller receives the full value they’re seeking. Both are left wishing for a better way. In response, the Snow & Ice Management Association (SIMA) recently took several steps to assist professionals in this area. Some solutions were offered at last year’s Snow & Ice Symposium, and this year’s Symposium, being held in Providence, R.I., is sure to have another slate of topics to address this issue. In addition, there was a significant step taken and announced to the industry in March. 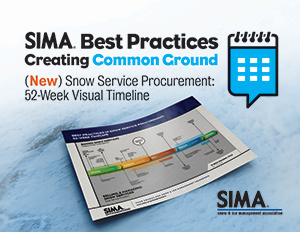 After months of development and peer review by a variety of industry stakeholders, SIMA finalized and release a document called “Best Practices in Snow Service Procurement: 52-Week Visual Timeline.” The document is an overview of the annual cycle of a snow and ice management operation, from two different perspectives, featuring colorful easy-to-read graphic images. One perspective is that of a facility or property manager—buyers of snow and ice management services. The other perspective is that of a service provider—sellers of these services. The timeline document is free and available to download at sima.org. This timeline has two primary uses. The first and most obvious use is as a tool for educating customers and prospects. By fully understanding the annual cycle of snow and ice management, they will be able to make more intelligent purchase decisions. After seeing the tool, buyers will quickly realize that there are optimal windows of time for each activity in the yearly cycle of a snow business for both planning and execution. The result most likely will be a much better outcome for both the buyer and seller. I see this as a great tool to be introduced early in the sales process. It also could be made available to prospective customers on your website or included with proposals in either printed or digital form. When buyers see this document early and often, they will be more likely to absorb the information and make decisions accordingly. The second and less obvious use of the timeline is for internal planning and execution. The best practices outlined on the timeline really are just that—best practices of leading-edge snow and ice management providers. A simple comparison of the best practices with your current practices will expose areas of opportunity. Which practices might your company need to improve this year? For example, one of the best practices is for snow and ice management contracts to be renewed in the spring, immediately following the end of the snow and ice management contract period. Some top snow and ice management pros have been taking this approach for years, and it is now considered an industry best practice, to be adopted by everyone. Of course, changing old habits and entrenched decision-making processes may result in quite a delay for complete adoption to this standard—if it ever happens. Regardless of adoption, the standard applies. At your next snow-planning meeting, take a few minutes to review the best practices timeline. Look at the recommendations built into the timeline and identify areas that require change to conform to the standards. Most importantly, decide how you’re going to use it for both sales and operations. Best wishes for a successful spring and summer.